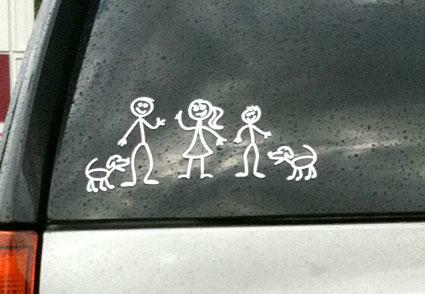 You've probably seen the family car stickers that boast a Mom or Dad who is proud to be a parent of an honor student. What about other bumper and window stickers for your car? From showing your pride to announcing your interests, supporting your favorite sports team or saving cats and dogs everywhere, there are many stickers to choose from. It's easy to find car stickers of all kinds at local retail shops, gift shops, and novelty stores. You can also find great websites dedicated to custom family car stickers designed just for you! Family Stickers - This company began customizing stickers in 2001. They offer standard stickers, custom stickers, and pet stickers. You can also find great window decals of all sorts. Want a custom sticker made? This is the place. Cute Stickers - Love cute stickers? Choose from bestsellers, boys, girls, parent, and even military family stickers. This website also allows you to enter your email address to receive announcements on promotions and specials. Car Stickers - This company is great for families who love butterflies, angels or fairies. You can also browse their animal and insect section or design an oval family sticker on your own. My Jolly Family - The owners of this company understand what expression is all about. You tell them what everyone in your family loves to do and they'll customize a car sticker just for you. For individuality in car stickers, this is a great website. Letter Rip - Dedicated to a Christian lifestyle, find family stickers of all sorts including stick figures. This is also a great website for animal stickers and decals as well as sports and wildlife. Big Paw Designs - Big Paw Design car stickers can show off your breed specific pet or tell the world Mom and Dad support animal rescue. Check out their pet stickers designed to support all the animals abandoned by Hurricane Katrina! No matter where you buy your car stickers, make sure they come with directions on how to apply them. Almost all stickers are made to last - they can easily endure the sun and have extremely tough adhesives. If it says to carefully mark your spot before you apply the sticker, it most likely means you only have one chance. If you decide to remove your sticker later, one of these techniques might come in handy. The most effective way that professional auto detailers prefer is to use a heat gun or hair dryer. Keep the hair dryer or heat gun a good five inches away and start on one end, heat, peel, and repeat until the sticker is totally removed. Over-heating or too-close heating can cause paint damage. Another effective way to remove stickers is to combine one cup of rubbing alcohol with one cup of water. Spray the sticker and let is soak for two minutes. Next, rub the loosened sticker off with your fingers and use a soft cloth and mild soap to get rid of any residue. If you do use a scraper, make sure it's not metal. These devices can damage your car. Find a rubber scraper at an auto parts store or have the sticker professionally removed. Family car stickers can shout who you are, what you like, where you've been, and where you're going. You can show off your family pride, favorite sport, or almost any activity or interest that is uniquely you!